Camp, like many Y programs, is about learning skills, developing character and making friends. But few environments are as special as camp, where kids become a community as they learn both how to be more independent and how to contribute to a group as they engage in physical, social and educational activities. Our counselors are dedicated to making sure camp is an amazing experience for every camper. ***Please Note: NOW ACCEPTING applications. If you have any questions, please contact our Financial Aid Specialist, Dana Ridpath at 610-713-5261. Campers are required to have a Community YMCA Membership at time of registration and throughout their time in camp. 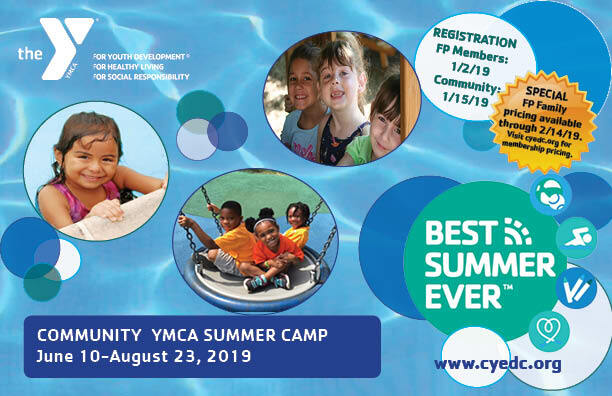 Register your child for camp EARLY — registrations are taken online and in-person at the Ridley Area YMCA and Lansdowne YMCA. Those applying for Financial Assistance MUST pre-register their child for camp along with the required weekly deposit. Financial Assistance is available for Day Camp and Sports Camp. Financial Assistance does not reserve a spot for your child unless camp registration is made in advance. Apply early – all Financial Aid approvals will begin after 2/14/18. Once you register online or in-person, other important camp information will come to you via email. Please make sure you give us a good, working email for all correspondence. Back by popular demand… the ePACT Network. You will receive an email invite to share information with the Community YMCA (medical forms/emergency forms/waivers etc. to get your child ready for camp). Click ‘Complete Registration’ to create a free account or log in if you already have an ePACT account. Enter the required information and share it with the Community YMCA so that our staff has access to your important information all summer long. It’s that easy.